American Lock’s solid aluminum padlocks are made from an exclusive aluminum alloy, offering protection similar to brass in most harsh or caustic environments. 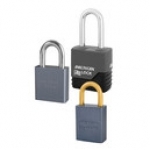 These durable padlocks are offered in nine colorful anodized finishes for easy identification. Plus, you can choose laser engraving to add employee or other key information on your padlocks. These are a cost effective option for protecting utility storage areas, sheds, gates and outbuildings.